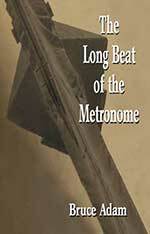 The literary art of the short story is alive and well in Bruce Adam’s collection of forty-two deftly written stories titled The Long Beat of The Metronome. Adam is able to paint compelling word pictures that make his characters memorable and his dialogues engaging. The stories, ranging from ‘Police Blotter’ and ‘The Choir Master’, to ‘Dudot Dreaming’ and ‘Genetic Lynx’ are like listening in to a rather succinctly told tale that captures attention and often leads to thoughtful reflection after the telling is told. A master storyteller in total control of his literary craft, Bruce Adam is a writer to be aware of and The Long Beat of The Metronome a collection to be prized and appreciated by those who enjoy originality and skill in a demanding and difficult form of literary expression — the short story.